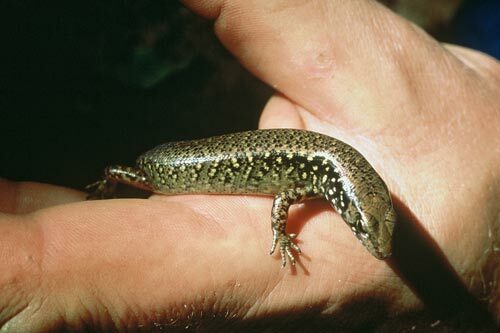 Whitaker's skink (Oligosoma whitakeri) lives in coastal forest and scrub. The species is named after the scientist Tony Whitaker, who has spent decades studying New Zealand lizards. During the day, the skinks retreat to warm, moist places such as seabird burrows and deep boulder banks. They forage on warm, humid nights. The species is found on two small, predator-free islands off the Coromandel Peninsula – Middle Island in the Mercury Island group, and Castle Island. There is also a mainland population in a small rocky area at the base of coastal hills at Pukerua Bay, near Wellington. Fossil bones found in the Waikato region suggest that these skinks were once more widely distributed.